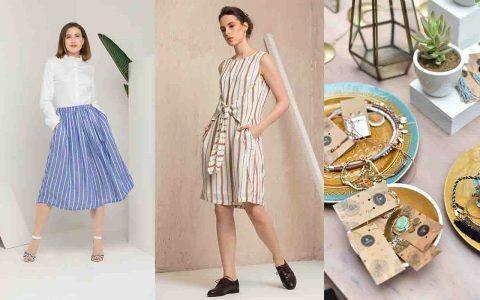 The recently concluded FDCI’s India Couture Week 2017 saw some social cause draped in shimmer along with sensual secrets personified through pastel shades, unconventional appeal and much more. 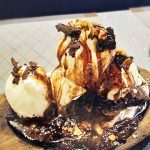 Here is all what we loved from the 7-day extravaganza that also celebrated its 10th year at the Taj Palace hotel along with some offsite venues in the capital, in keeping with its decade-long existence. 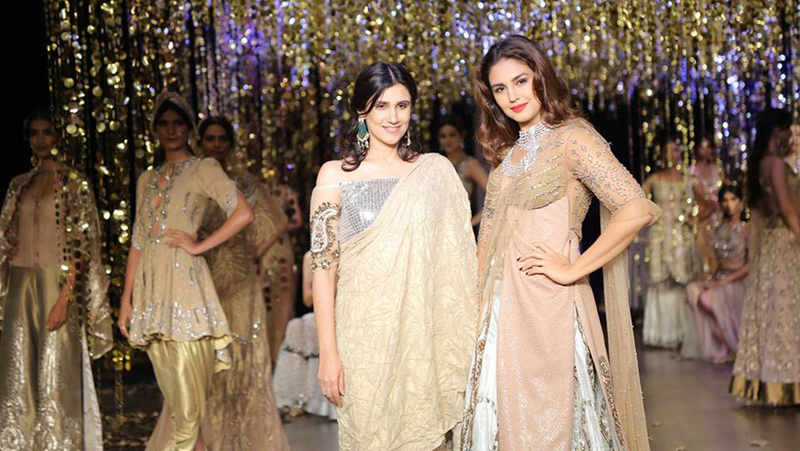 Monisha Jaising’s collection was styled like the stage of an opera house. It featured womenswear, with concept dresses and gowns featuring high slits to add a contemporary twist. Ruched dresses and skirts in sequined, shimmery fabric, velvet, tulle, organza and satin formed a large chunk of the collection. Sequins and beadwork were staple embellishments and the dominant colours were earthy maroons, icy blue, moss green and black. Shilpa Shetty walked the ramp in an orange and gold Banarasi dress. The dress was an off-shoulder number with a thigh high slit and a short train. 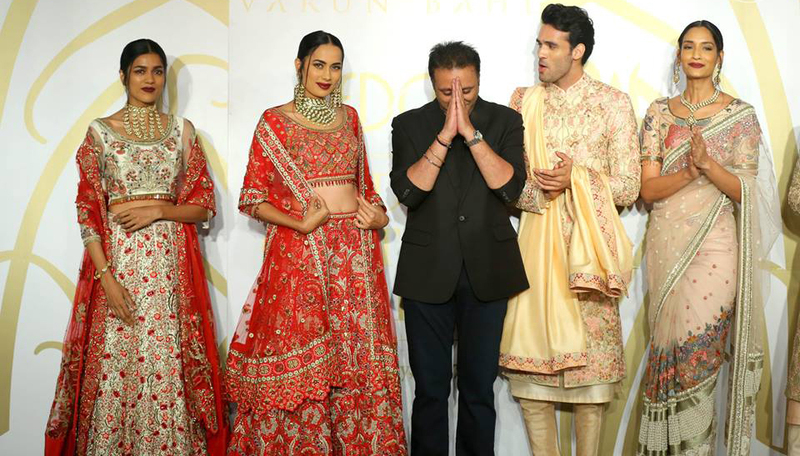 Varun Bahl’s vintage bohemian touch saw floor length dresses, layered lehengas, saris for women, and churidars, jackets and achkans for men. To juxtapose the heavily embroidered dresses and skirts, the outfits were matched with lighter net duppattas. Short capes were paired with saris and lehengas. The colour palette was a heady mix of peach, blush pink, greens and topped off with warm reds and rust. 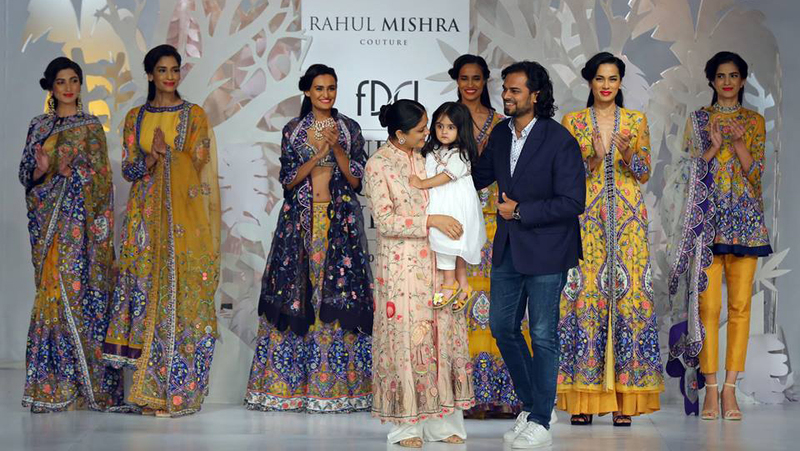 MRahul Mishra’s “Parizaad” saw a brave attempt of teaming seven colours together in one outfit. Inspired from the roots of Islamic architecture, the collection saw floral motifs and geometric embroidery that was an ode to the tiled mosaics. Pastel shades such as blush pink, white and lavender formed the base for many dresses, layered gowns, anarkalis and lehengas. To break the monotony, there was a dash of mustard yellow and black. 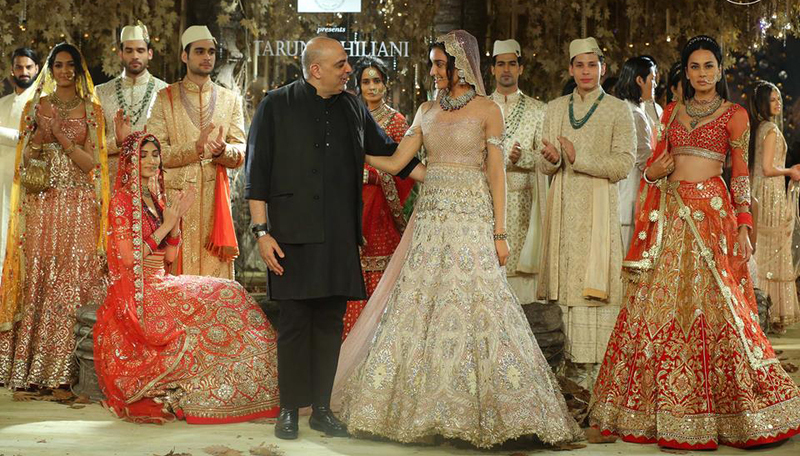 Tarun Tahiliani presented ‘Tarakanna’, a bridal and occasional wear collection, which was inspired by the twinkling night sky. 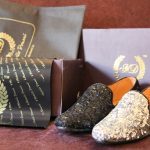 The 85-piece collection offered saris, lehengas and anarkalis for women, and dhoti kurtas, bandhgalas and layered sherwanis for men. While gold was prominent, there were staple offerings in reds, oranges and pinks. The use of pale iridescent blue, black, blush pink and grey took it up a notch. The use of the Gandhi topi deserves a special mention. Rina’s new couture collection, #HonorTheSmile featured voluminous pieces boldly parading the drama and opulence of royalty. Dripping necklaces, wondrous centre-pieces, oversized gems and entangled motifs showcased the unending, awespiring, magnanimous and complex persona of our ideal woman. The silhouettes were graceful in their softness and sensuality, the relevant half of yin and yang. The elements of royal Kundan jewellery, lending a glow into the metallic, especially created liquid golds, silvers, peuters to give a lightness to the clothing. Manish Malhotra’s Sensual affair saw lot of trains, on gowns, lehengas, capes in short and long lengths. Shades of white, beige and cream gold dominated the colour palette. 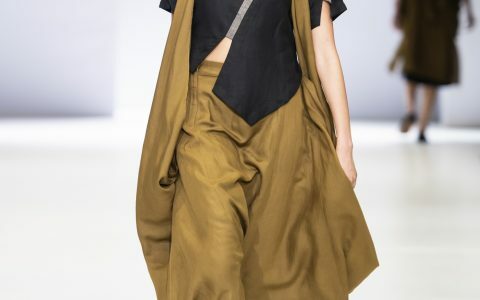 This collection also saw edgier, sharp silhouettes and cuts, deep necks, backless numbers and fitted corset-like blouses The signature use of silver and gold thread embroidery, pearl and sequin work was quite visible. Showstopper Ranveer wore a deep blue intricately embroidered velvet jacket, with a flowy kurta, and grey and white checkered pants completed the outfit. 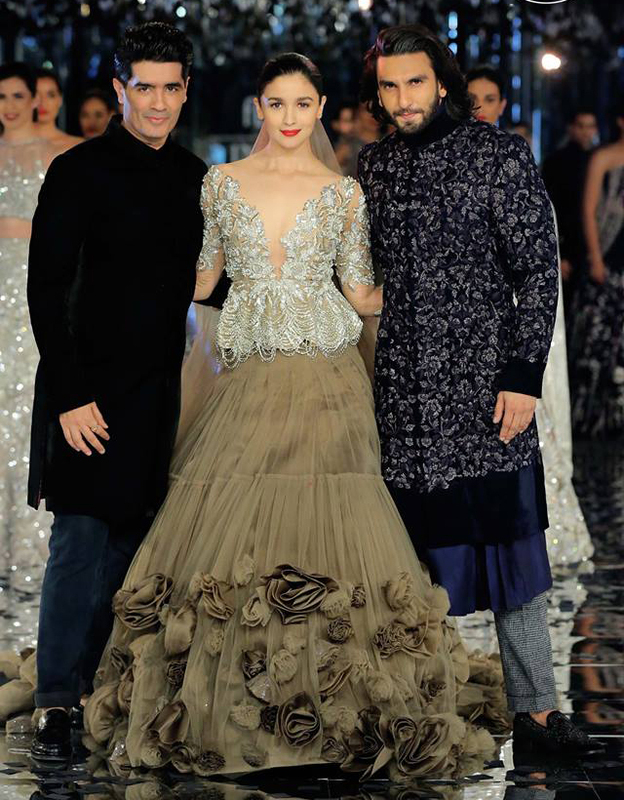 And, Alia Bhatt wore a mud brown lehenga replete with a long train with flowers sown on the hemline for extra flair. Paired with a heavily embroidered and sequined deep-neck blouse.